Motorcycle experts say that you need to change helmets every few years in order to ensure you are wearing a helmet that is still safe and retains its original protective qualities. If anything, as far as I’m concerned, my visors only last about a year before they are too scratched to see through comfortably. My previous helmet, a Caberg Trip, had lasted me more than 3 years and was showing signs of its age. It creaked at the hinges and the visor would not lock open correctly anymore. It had been a good helmet and had served me well on three continents. But the time had come to upgrade to something new. My choice, after a thorough study of what was on offer, went to another Caberg. I think that they offer very good quality helmets at competitive prices. I chose the new Caberg Duke, a flip-front model which is the grandson of the Trip I owned. 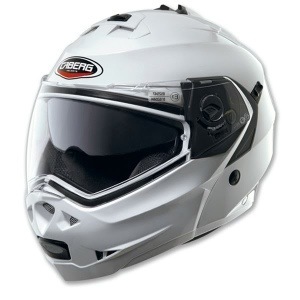 It has a 5 stars SHARP rating, the highest safety rating awarded by the independent helmet safety scheme. This, and good online reviews were the main reasons that drove my choice. 1- The helmet fits more snugly on the head while still remaining very comfortable. 2- It makes the Duke very sound-proof; a quality I can’t rate highly enough as it makes riding long distances that much more comfortable. 3- It keeps your head nice and warm. This could be seen as a disadvantage in warmer regions but I live in the UK and a warm helmet is a good thing to have. The Duke also improves on the Trip with its new visor. To begin with, the new visor opens and closes with a feel and noise that are testament to higher quality. You could compare this to the difference between shutting the door of an old car and a new one. Just like in the VW Golf commercial; it’s precise and muffled. Then there’s the anti-fog visor insert which works wonders. I was very positively surprised when I rode in the snow with my visor down and experienced absolutely no fog! I repeated this in the rain and it performed just as well. Brilliant! I chose my Duke in white as I always try to enhance my safety. I read in a British Medical Journal article that, compared with wearing a black helmet, the use of a white helmet was associated with a 24% lower risk of crash related injury. As good a justification as any to guide your choice of colour. [although I’m pretty certain that riders who chose to be conspicuous are more responsible and therefore ride in a safer manner too…]. So, in conclusion, I would highly recommend the Caberg Duke to anyone; it has a top safety rating, it’s very comfortable and well built, it is warm and silent and doesn’t fog-up. It is also very good value for money at less than £150! After a few months of use you might find that your precious Pinlock Antifog Insert has stopped sticking naturally to your visor. 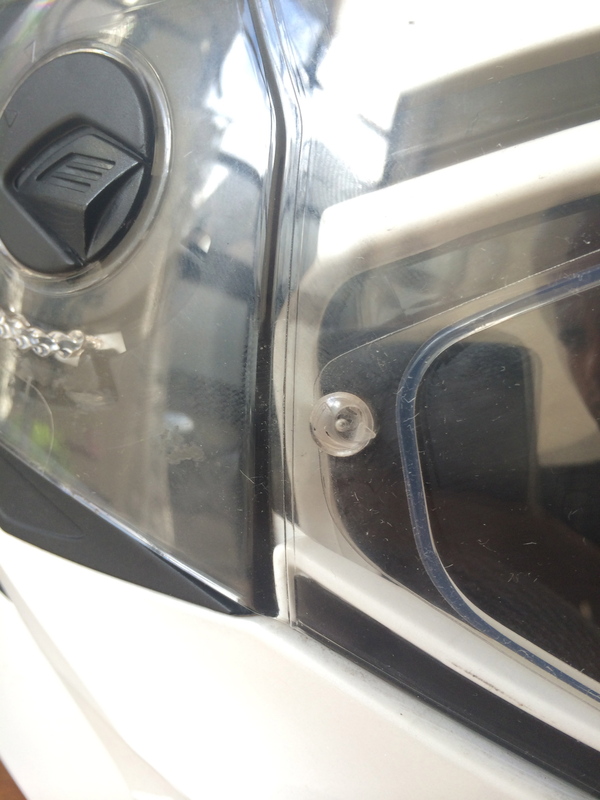 It has become a bit loose and does not provide the anti fogging you expect from it because the silicone seal does not stick to your visor anymore. I had this problem and worried that I’d have to buy a new insert but this website provided me with the answer I was looking for. Basically, the pins which hold the insert are eccentric and can thus be adjusted by turing them. This will reduce the distance between both pins and allow you to make the fit of the insert tighter, thus solving the problem of a loose lens. The Pinlock website also offers some very good information about how to clean the insert lens and I suggest you do it at least once a year. 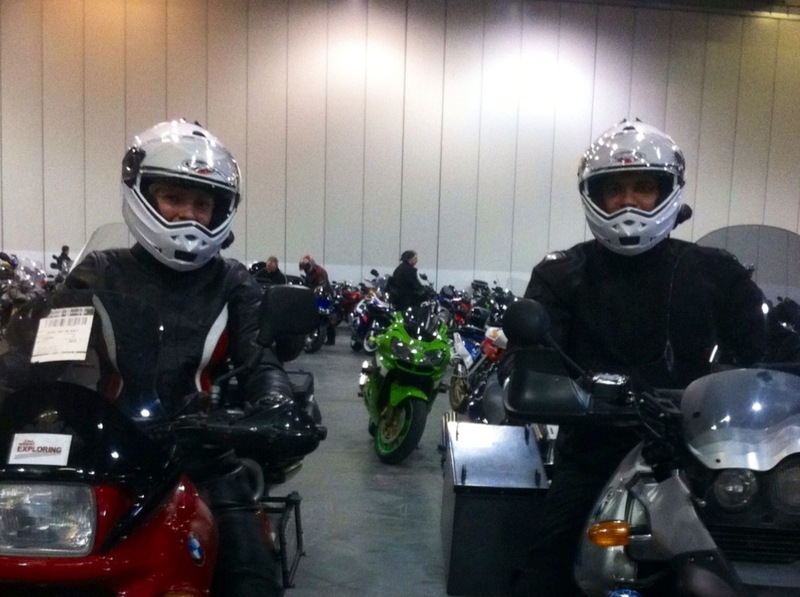 If I ever need to buy a motorbike helmet, I shall always have the comfort of knowing exactly where to go for advice! Just got mine today, I’ll let you know how it goes!